The summer months can take an exhausting toll on your lawn and landscape features. Between the scorching summer heat, seasonal insects, and minimal rainfall, your lawn and shrubbery can suffer a lot stress from the conditions. Here are some tips for keeping you lawn healthy, full, and green all summer long. Lawns need an average of about one inch of water per week, and more during hotter days. With sprinkler systems, it is sometimes difficult to know if the water is getting deep enough to the roots. Try using a rain gage or an empty can or cup to track the amount of water that feeds your yard. For more information about sprinkler systems, read our blog about establishing and using a sprinkler watering system. Sometimes hand watering your lawn may be slightly more time consuming, but you have the advantage of knowing that you are watering evenly and deep enough for the roots to get enough nutrients. Watering your lawn deeply and regularly will keep your lawn healthy and full, but will also mean that your grass will become dependent on a consistent watering schedule. For the health of your lawn, establish a schedule that works for you, and stick to it. In the summer, it is important to raise your mower blade. Allowing your grass to grow taller will help your lawn become more drought tolerant. Plus, the tall grass helps to shade the soil below, preventing weeds from germinating. Ideally, your lawn should be mowed at about 2-4”. The mower blades should be sharp to make sure that they are cutting your grass and not tearing it. Dull blades can be stressful on the grass’s roots, especially during hot weather. Applying fertilizer in hot weather can burn your lawn as well as stimulate growth that will not be able to survive in the summer heat. It is vital to not fertilize dormant and brown lawns because they are signs of unhealthy roots. It is best to fertilize your lawn when its roots are full and healthy. When fertilizing, it is better to maintain a regular, yearly feeding schedule. For optimal results, try fertilizing your lawn four times a year; early spring, late spring, summer, and fall. Because many fertilizer brands have different types of fertilizer for all seasons, be sure to use each type of fertilizer accordingly. Summer is an important time to remove young weeds before they bloom and scatter throughout your lawn. Weed-killing products are a quick and easy way to remove weeds, but it is important to know that weed killer can be damaging to grass that is already stressed in the summer heat. If you need to use a weed killer, try to use the products when temperatures are below 85 degrees. 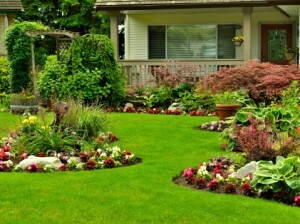 For more lawn care and landscaping tips and tricks, check out our Green Blog. If you aren’t the do-it-yourself type, contact the professionals at Greener Horizon to arrange a landscaping consultation.